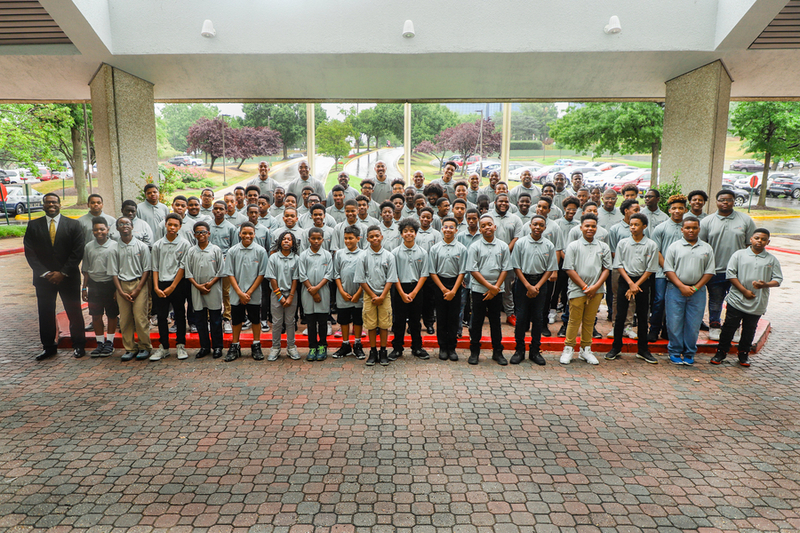 LANDOVER, MD, August 21, 2018 — Since its inception in 2015, participation in the 13th Man Summer Classics, a leadership empowerment camp, has more than doubled in the Washington, DC area. The 13th Man has also expanded its unique blend of sports, entertainment and learning to its chapter in Charlotte, NC. Over 70 young men, ages 11 to 17, participated in workshops including leadership lessons, recreational activities, and evening “Guy Talks”. Highlights included presentations by Pastor Shawn McBride that focused on “LIFE” Listen, Integrity, Friendship and Endurance, and “Political Power” by Maryland State Delegate Jay Walker. “Leadership Lessons” were presented by Entrepreneur and Business Coach Wanda Alexander and Leadership Trainer Larry Naylor. The 13th Man Founder Davon Kelly presented a workshop titled, “Commanding a Room”. Other topics featured during the empowerment program included finance and personal grooming. The multi-faceted program also featured Kevin Green who facilitated a vision board exercise and a Business Leader Panel discussion with 14 successful members of the community. The young men were matched with these mentors based on their expressed interest and continued their conversations over a formal dinner. Every evening, the group was divided by age and participated in a “Guy Talk” discussion. This tradition encourages the young men to ask questions that, in some cases, they do not have a male figure in their lives to address. Davon Kelly started the 13th Man to pay homage to the mentors that helped shape the direction of his life. Kelly proudly added, “This year, we launched the Everett E. Kelly 13th Man Scholarship, named after my father, to encourage active members of the 13th Man to continue their pursuit of excellence.” Three members were awarded $2,500 each towards higher education in the 2018–2019 academic year. The 2018 recipients of the Everette E. Kelly 13th Man Scholarship are Aaron Downs (Morgan University), Daniel Cotton (Shenandoah University), and Machai Purnell (College of Charleston). The 13th Man Annual Charity Golf Outing will be held on September 17, 2018 at Norbeck Country Club in Rockville, MD. The annual event benefits the year-round 13th Man programs, that include academic and SAT/ACT tutoring, enrichment and empowerment programs and mentoring. To support the 13th Man, please register for the Charity Golf Outing. The 13th Man was founded by E. Davon Kelly in 2015. There are two chapters: Washington, DC (2015) and Charlotte, NC (2017). The free leadership camp Classics, the 13th Man's signature event, are held in the spring (Charlotte) and summer (DC). The programs focus on life skills and enrichment activities that encourage participants to become leaders in their communities and learn how to be accountable for their actions and decisions. The 13th Man is financially supported by sponsors and the annual 13th Man Charity Golf Event. For more information, contact the 13th Man at 301.429.8807 or visit http://www.the13thman.org/sponsor.html. Headquartered in Landover, Maryland, NOVAD Management Consulting employs over 125 people throughout the United States. NOVAD's services include project and program management, process re-engineering, loan servicing and financial advisory services. The award-winning My Barber's Lounge opened in Greenbelt in 2012 and Forestville in 2013. The Barbershops were recipients of the 2013 Best of Gazette newspaper's award, Steve Harvey's Neighborhood Award for Best Barbershop in 2014 and the 2016 Greenbelt Small Business Excellence Award. Salon DK opened in March 2017 in Bowie, Maryland. The 13th Man is also supported by Davon Kelly's inspiring book, From Courtside to the Boardroom: A Legacy in the Making.